Soulfire will merge your magicka pool with the power reserves of your equipped weapons. In effect, your magicka pool acts as an additional layer of charge over the regular charge of your weapon. Added 'Soulfire - Endow' to give the Soulfire ability to followers. Added Soul Scry and added spell books to vendors/loot. Added Soulfire spell book to some vendors/loot. 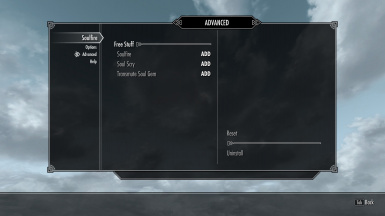 Integrated Smart Souls / Acquisitive Soul Gems functionality into Soulfire, with the difference that you unlock via perks the features those mods give you in full by default (full functionality can be enabled in MCM regardless of perks). Significantly changed how Soulfire charges weapons and interacts with your magicka pool. The speed at which Soulfire recharges your weapon is now totally dependent on your magicka regeneration rate and your enchanting skill. See the description in the readme for details. Removed the "free recharging" at enchanting level of 100. Added an improved max charge fix to Soulfire. Enabled by default. The older method can be switched to in the MCM if you prefer it. Added the ability to adjust how quickly Soulfire recharges your weapon. Check the mod description for details. The accidental full recharge problem should be mostly solved now. I'm not sure it's possible to ironclad guarantee it won't happen, but it should be very rare. Sometimes, Soulfire would just completely charge a weapon once turned on. Hopefully this is a little bit less likely now, but the problem is not totally solved. Made Soulfire a permanent effect (sort of - the way Dead Thrall is(n't really, but close enough)). Recharge speeds are a bit more consistent now between different hardware configurations. 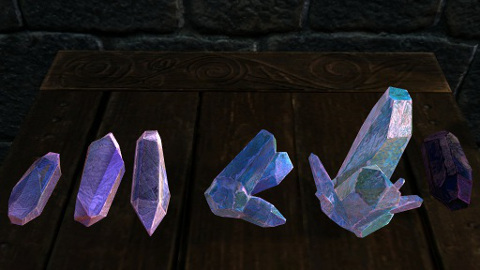 Recharge speed improves now in addition to magicka cost as you increase your Enchanting skill. Minor scripting improvements. No functional change. Update to detect maximum charge on weapons equipped in the left hand as well as the right when activating Soulfire. Requires SKSE. The last version to not require SKSE. No longer supported. NOTE: Mysticism - The Lost Art supercedes this mod and should be used instead. 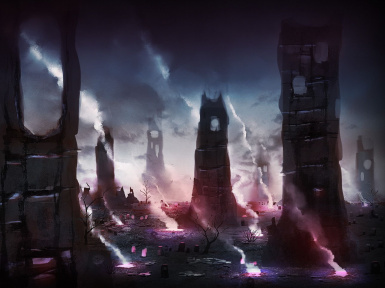 Soulfire adds several features to the game in the form of perks, lesser powers, and spells, with the goal of making the use of enchanted weapons and capturing of souls to make and power them, more interesting and less of a boring, tedious, micromanaging grind. (Note this video is a bit out of date: it only uses the "Classic" channeling method, the criticism about free recharging at 100 Enchanting is no longer valid, and the recharging method is a bit different than depicted here. Still, you will get the gist from watching this video. The namesake lesser power of this mod will merge your magicka pool with the power reserves of your equipped weapons. In effect, your magicka pool acts as an additional layer of charge over the regular charge of your weapon. If you have enough magicka to fully recharge the weapon, the weapon will be fully recharged immediately. Otherwise, after draining your magicka, you will regenerate magicka into the weapon instead of into your magicka pool, at your natural magicka regeneration rate (including any multipliers). Once the weapon is fully charged, you will regenerate magicka normally. * If you are charging two weapons at once, your magicka will be distributed evenly to both. If a weapon is channeled, Soulfire will always recharge it up to its maximum charge. If a weapon is not channeled, Soulfire will only recharge it up to the charge it had when you equipped it. If it was fully charged, then Soulfire will charge it back up to full charge after you use it. If it was half-charged, then Soulfire will only recharge it back up to half charge. If it was not charged at all when you equipped it, then Soulfire will not recharge the weapon at all. Standard: While Soulfire is active (and *only* while it is active), the lesser power 'Soulfire - Channel Weapon' is added to your spell list. Drop the weapon from your inventory into the world , target it with the cursor (you will need to be able to see the weapon name, stats, etc. ), and activate the power. The weapon is now channeled, and will remain channeled indefinitely. You can channel up to 32 weapons this way at a time (once you go over the limit, weapons you haven't used in a long time will be unchanneled automatically). Classic: Whenever you activate the Soulfire lesser power, any weapons you have equipped will be immediately channeled. However, once you unequip them they are no longer channeled. This is the channeling method long-time users of Soulfire will be familiar with. You select which method you prefer in the MCM. NEVER try to channel a stack of weapons with the standard channeling method. A stack of weapons is anything ending in a number like 'Iron Sword of Embers (10)'. When you do this, it confuses the game and it will not be able to track the items properly anymore. If you accidentally do this, immediately go into 'Options' and under 'Soulfire' select 'Clear Channeled Weapons'. That will put things back in a workable state. They charge their weapons at a constant 1/2 point per second regardless of Enchanting skill or any other factor. Instead of using magicka to charge weapons, they suffer a 75% hit to magicka regeneration. This applies regardless of whether they are actually charging a weapon or not. They can't channel weapons. Even giving them a weapon you have channeled yourself will have no effect for them. To remove the Soulfire ability from a follower, target them again and activate the 'Soulfire - Endow' lesser power. Soul Harvester allows you to more intelligently trap souls into soul gems, helping you to avoid accidentally trapping a soul into a soul gem which is too large for it, effectively wasting that gem. If you are familiar with "Smart Souls" or "Acquisitive Souls Gems", this feature is very similar - and, once you unlock the perks, it is the same as having one of those mods installed. Importantly, note that you can enable the full Smart Souls functionality immediately in the MCM, if you don't want to screw around with the perks. In addition, the first perk in this perk branch will allow you to tell if you don't have a matching soul gem for a soul you are trying to trap, as soon as you cast the spell and before you finish off the target and capture the soul. This gives you a chance to let the effect expire on the target, or drop the larger gems you don't want to waste by capturing the soul, or even acquire a matching soul gem somehow. Novice Conjuration - You will get a notification when you have no matching Soul Gem for a trapped Soul. Apprentice Conjuration - Trap Petty souls in Petty Soul Gems only. Adept Conjuration - Trap Lesser souls in Lesser Soul Gems only. Expert Conjuration - Trap Common souls in Common Soul Gems only. Master Conjuration - Always trap souls into a matching Soul Gem. Finally, Soul Harvester does one more thing: it fixes the bug where a partially-filled Soul Gem can be "emptied out" by dropping it into the world (and, that partially-filled gems don't correctly stack). With Soul Harvester, if you capture a soul into too large a gem, there is no getting it back out . This was done to make the perks actually worthwhile. If you don't like the removal of this bug/exploit, again remember that you can just enable the Smart Souls functionality which removes the need to use the exploit in the first place. Azura's Star and The Black Star can still be emptied out this way. I don't think I can fix that. Soul Scry, an apprentice-level Alteration spell available at most spell book vendors, allows you to perceive the soul quality of creatures and people in the immediate area. Novice Alteration - Soul Scry can distinguish Petty, Lesser, and Common Souls, from Greater and Grand ones. Apprentice Alteration - Soul Scry can distinguish between all Soul qualities. Transmutes one Greater Soul Gem to a Grand Soul Gem, or a Grand Soul Gem to a Black Soul Gem if the caster is carrying any. An expert-level Alteration spell. The spell book is not available from spell vendors, and it is not available anywhere in the world. In fact there is no spell book for it at all. There is a short mini-quest to get it (no journal entries or notifications) and, without giving too much away, you will have a chance to complete this quest sometime during the Dawnguard quest line. So, if you haven't started Dawnguard yet, getting the spell is 100% achievable. 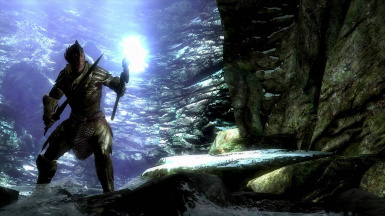 If you have started Dawnguard, you may have missed your chance to acquire the spell normally so you should probably look at the spoilers below. Of course, you can also just give yourself the spell in the MCM. See below for more specific spoilers. Some spoilers have been obscured. Use rot13.com or similar to decode. Soulfire: Will show up in boss loot at all levels. Will to start to be available at more spell vendors as your Magic skills increase. It is also available at two locations in the world: VA LBHE EBBZ NG GUR PBYYRTR BS JVAGREUBYQ NAQ ARKG GB ZNYLA INERAF PBECFR. Soul Scry: Will show up in regular loot after level ten and at spell vendors at all levels. It is also available in one location in the world: ARNE GUR JBEQ JNYY VA OYRNX SNYYF ONEEBJ. Transmute Soul Gem, Hint One (slight spoiler): LBH YRNEA OL QBVAT. Hint Two (total spoiler): LBH ZHFG HFR RNPU YVTUGAVAT NGGENPGBE VA GUR FBHY PNVEA BAPR. GURER NER SBHE. VS LBH UNIR NYERNQL HFRQ RIRA BAR BS GUR YVTUGAVAT NGGENPGBEF, LBH PNA ABG YRNEA GUR FCRYY GUVF JNL, NAQ GUR BAYL JNL GB YRNEA VG GURA VF SEBZ GUR ZPZ. Make sure the Soulfire lesser power is toggled off, save, then install the newer version. Run the uninstaller from MCM first, and wait for it to say "Complete". Uninstalling mods from existing games always carries some risk, however running the uninstaller will put Soulfire in a state where it can be uninstalled very safely. Not compatible with Smart Souls, Acquisitive Soul Gems, or Acquisitive Soul Gems Multithreaded. 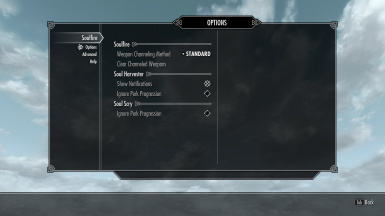 Uninstall these mods before you install/upgrade Soulfire. If you like, you can enable the full Smart Souls functionality from the start, rather than relying on the perks added to Soulfire. 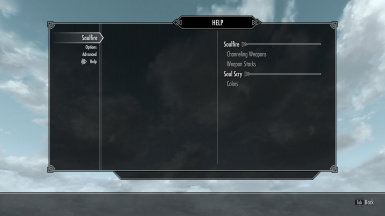 Compatible with any mod that adds new soul trap spells, or that changes the existing ones, provided it uses the magicSoulTrapFXScript in the usual way. Compatible with all perk mods, SPERG, etc. ATTENTION: While I reserve the right to delete off-topic comments and trolling from my threads, I WILL NEVER BAN ANY USER FROM ACCESSING ANY OF MY FILES, NO MATTER WHAT THEY POST IN THE COMMENT THREAD.